We aim to be a company friendly both to humans and the earth. We recognize that the environmental issues such as global warming and biodiversity crisis are important issues for the human society. We strive to contribute to the reduction of the negative environmental impact and develop business activities that promote nature conservation. Through our business activities to the extent technologically and financially allowed, we promote an environment that is friendly to the earth and regional community. Using the environmental management system we implement activities that all our employees can contribute to environmental improvement and conservation. 1. Promote the effective use of resources through environmentally friendly R &D, design, production, sales, reuse, recycling, and waste reduction. Contribute to the society that promotes nature conservation through energy conservation. 3. Set environmental objectives and goals, conduct a periodic review on the environmental policy, and promote continuous improvement on the environmental management system. 4. Comply with the environmental laws, regulations and ordinances. 5. 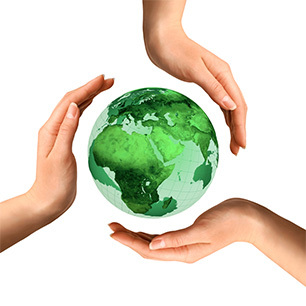 Participate at a personal lever in environmental conservation activities of the community that promote biodiversity conservation and reduction of carbon dioxide.